It takes a lot of power to heat up the elements on an electric stove quickly. In fact, it takes so much that the circuit has twice the voltage of circuits that power regular outlets and lights. Conventional circuits more or less operate at 110 volts, but a range needs 220-volt power. To get this voltage, you have to install a special breaker in the panel that contacts both hot bus bars. Whether you install a plug for the range or hardwire it directly to the circuit, you shouldn't consider this a do-it-yourself project. Wiring mistakes can cause injury, fires and damage to the stove and panel, so it's best to hire an electrician to make the connections. A breaker – Check the amperage rating of the stove. It's probably 50 amps, but it may be 60. Purchase a two-gang breaker with that amperage rating. The breaker has to fit the panel, so check the brand and buy a breaker with the same brand. The three main brands on the market are Square-D, Zinsco and General Electric. Electric cable – You need enough cable to extend from the stove to the panel with about 2 feet to spare. You'll need an 8-gauge, 3-conductor cable. Since the ground wire isn't counted as a conductor, the cable you purchase should actually have four embedded wires. A receptacle – The receptacle, if you use one, has to fit the plug on the range. The one you will probably need is a NEMA-14-50A, which you can get at any hardware store. If that doesn't work, take a picture of the range plug and use that as a reference. After you have pulled the cable through the walls and left about a foot extra at the panel, the electrician will remove the panel cover to install the breaker. A 220-volt breaker consists of two stacked 120-volt ones, so the panel has to have two spare slots for it to occupy. The hot wires in the cable are red and black, each of which are connected to a breaker in the set. The white cable wire gets connected to the neutral bus and the ground – or bare – wire to the ground bus. After all the connections have been made, the breaker snaps into place and the circuit is energized. The breaker has to contact both brass bus bars in the panel to supply 220-volt power. Both of these bars are always energized – even when the main breaker is off. 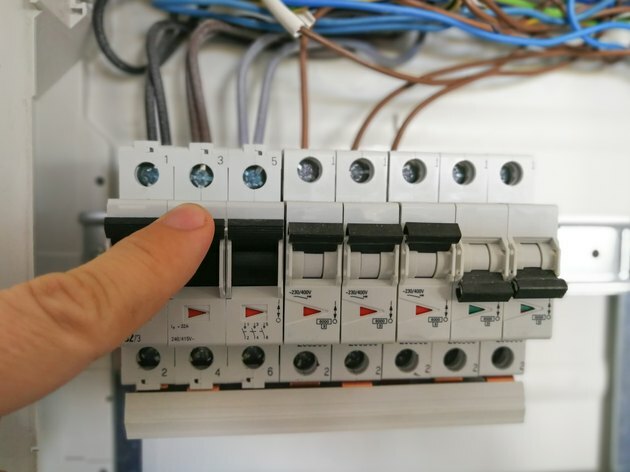 The fact that touching either of these bars with your tools or fingers is dangerous is one of the main reasons why an electrician should do the work in the panel. After installing the breaker, turn it off and you're ready to hook up the stove. Whether or not you're installing a receptacle, you need to nail or screw an electric box to a stud behind the range and route the cable through it. To connect a receptacle, wire the red and black wires to the two brass terminals, the white cable to the chrome terminal and the ground cable to the green one. Screw the receptacle onto the box and you're ready to plug in the stove. It's unusual to hardwire stoves, but if you have to do it for some reason, you'll need extra cable. This is so you can reach into the electrical control panel while you're positioned between the stove and the wall. The connections are the same – black and red to brass terminals, white to chrome and ground to green. If you are hooking up an older stove, it may have a three-prong plug. These used to be legal, but nowadays the code calls for a separate ground wire on every 220-volt circuit. You will need to retrofit the cord with one that has a four-prong plug. Attach the hot wires of the new cord to the brass terminals and the neutral wire to the chrome terminal. Then, bond the ground wire to a metal part of the stove by drilling an 1/8-inch hole, driving a green ground screw into the hole and attaching the ground wire to that screw.